Wilson Raj Perumal allegedly predicted online that Cameroon would lose to Croatia 4-0 and have a player sent off in the first half. RIO DE JANEIRO — A convicted match-fixer denied a report in a German magazine Tuesday that he predicted the result and details of a World Cup football match. Cameroon’s football federation said it was investigating the report in der Spiegel magazine that Wilson Raj Perumal accurately predicted in an online chat with one of its journalists that Cameroon would lose 4-0 to Croatia and would have a player sent off in the first half. And that is exactly what happened in the June 18 match. 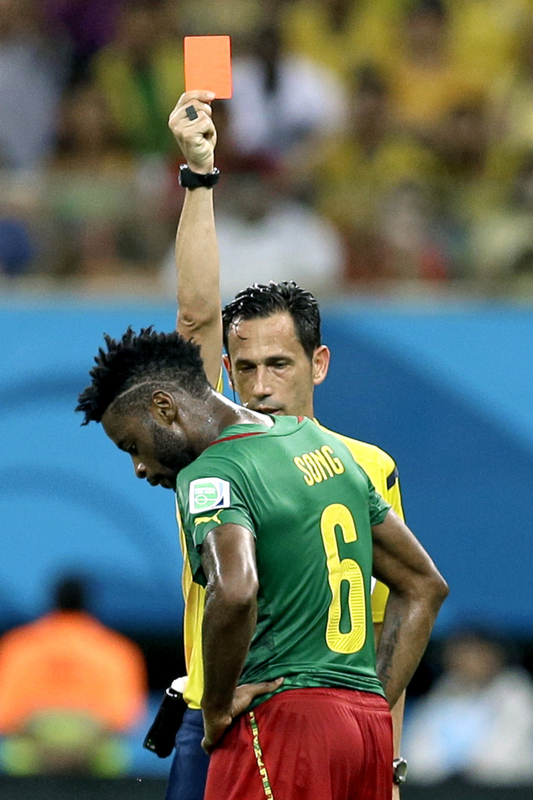 Cameroon midfielder Alex Song was sent off before halftime for striking Croatia striker Mario Mandzukic in the back. Der Spiegel’s claims rang alarm bells because Perumal is the best-known match-fixer in football. He was convicted of fixing matches in Finland and suspected of fixing other games in Africa and involving African teams. He also isn’t averse to self-publicity, having recently published memoirs with two journalists as co-authors. Perumal denied having predicted the outcome. “The Facebook chat with the Der Spiegel journalist took place a few days after the match – June 21st, as confirmed by my Facebook log,” his statement said. One of the Spiegel reporters involved, Rafael Buschmann, said the magazine stood by its story. “We firmly stand by our assertion that Mr Perumal wrote in a Facebook chat with der Spiegel some hours before the world cup match Croatia vs Camerooon, that the result of the match will be a 4-0-victory for Croatia and that a player of Cameroon will get a red card in the first halftime,” Buschmann said. Earlier, Cameroon’s football federation had said it instructed its ethics committee to open an investigation. The federation, Fecafoot, evoked the possibility that seven players on its team may have been corrupted. “Recent allegations of fraud around Cameroon’s three 2014 FIFA World Cup preliminary games, especially Cameroon vs. Croatia, as well as the ‘existence of seven bad apples (in our national team)’ do not reflect the values and principles promoted by our administration in line with the FIFA Code of Conduct and the ethics of our nation,” Fecafoot said in the statement. “We are strongly committed to employ all means necessary to resolve this disruptive matter,” the federation said. That game was the low point of a disastrous World Cup for Cameroon, which conceded nine goals and scored just one in its three games. The Croatia match was also marred by an argument between Cameroon teammates Benoit Assou-Ekotto and Benjamin Moukandjo that ended with Assou-Ekotto head-butting his teammate.